These tunes where created for Children, ages 1-101. This album was created so that Christians everywhere can learn how to display God's agape Love in their lives. When it is displayed in God's people, then we will be ready for Jesus' second coming..
As a child, Ruth was surrounded by music from her earliest recollections. She began studying piano at age eleven with the late Betty Burt. As a teenager, Ruth accompanied her father's solos on the piano. Her husband Les was born and raise in Los Angeles County. He attended Newberry Park Academy and is employed at Pacific Union College. They met in a Church in Perris California 1977, and married later that year in Hemet California. Les and Ruth have two sons, Les Andrieux, Jr. and Matthew. 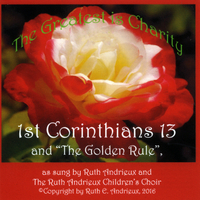 Ruth began writing music at the age of nineteen, published her first songbook in 1985, the second song book in 1997, "Songs for All of God's Children". Ruth and her husband Les have produced 5 CD's: "Only Me", a blend of inspirational and gospel songs, "Celebrating Him" contains Christian bluegrass and classically orchestrated hymns, "In The Beginning God", is a delightful Children's collection and "God's Gift of Love" is a mini album of Christmas songs, "Thy Word have I Hid in My Heart" with 42 Bible verses in 2004, "Let's Get Wild for Jesus" was produced in 2005 and "Fiesta Time with Jesus" was been produced in 2006, in 2008 "We'll Power up with Jesus" and "Bible Verses for God's Children" and in 2009 "We Will Praise the Lord". In 2010 they produced "Thou Art Worthy, O Lord". In 2013 "Written in Stone, The Ten Commandments" was composed so that children everywhere can put God's Law into their minds through music. The latest album and DVD is, "The Greatest is Charity". I believe that when Christian love others with God's Agape Love, that Jesus can return and take us to His home in Heaven at the second coming. In 1997, God touched Ruth with divine healing after she followed the advice of James 5:14 and 15. She would love to come and share this with you and your friends.